Dr. Juturu Rambabu is one of the best Acupuncturists in Nazarathpettai, Chennai. He has been a practicing Acupuncturist for 9 years. 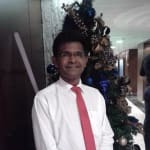 He is a qualified Diploma in Body Spa, P.hd (Acupuncture) Sri Lanka, Diploma in Reflexology and Acupressure, MD in Acupuncture, Diploma in Acupuncture, REIKI 1, II, III Levels . You can meet Dr. Juturu Rambabu personally at Dr.Raambabu Juuturu, Acupuncturist in Nazarathpettai, Chennai. Save your time and book an appointment online with Dr. Juturu Rambabu on Lybrate.com. Lybrate.com has a number of highly qualified Acupuncturists in India. You will find Acupuncturists with more than 28 years of experience on Lybrate.com. Find the best Acupuncturists online in Chennai. View the profile of medical specialists and their reviews from other patients to make an informed decision.